My family owned the Tobique. My grandfather bought it. That's right. Not a model railroad. A real railroad. In 1885, the Tobique Valley Railway Company (TVR) began constructing a standard gauge 28-mile right-of-way from Plaster Rock, New Brunswick, Canada to connect with the New Brunswick Railway at Perth Junction. Perth-Andover is a village in Victoria County, New Brunswick, and is divided with Perth on one side of the Saint John River and Andover on the opposite bank. The river came to play an important role in the history of the Tobique Valley Railway. The TVR was originally built to tap the gypsum deposits around Plaster Rock. By 1891, only 14 miles of track had been laid down. This was difficult terrain to build on and construction costs began to mount quickly. The whole line was completed in 1893 and it opened for traffic in 1894. In 1897 the Canadian Pacific Railway leased the TVR for a period of 999 years. My grandfather had the foresight to buy the railway. I'm not sure if he bought it before or after the CPR leased it. This was long before my time and my grandfather died before I was born. My uncle managed our ownership after that along with a trust company. After he died my brother and a cousin alternated as President. The CPR worked the railway but the line deteriorated over the years as traffic fell off. Trucks took over much of the work hauling gypsum and wood chips. By the '80s the maximum speed restriction was 20 mph and some parts of the right-of-way were held to 8 mph. Squatters had taken up residence on some of the track as bits and pieces fell into disuse. A terrible winter storm swept through New Brunswick and created the worst flooding in years. Here are photos copied from The Bugle, April 9, 1987. 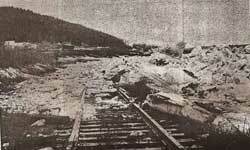 The storm destroyed part of the Shogomoc Division and isolated the Tobique Valley Railway. 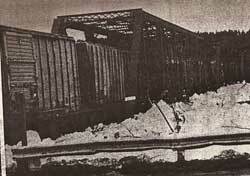 Freight cars loaded with ballast were parked on the bridge to try holding it in place but the pressure of the loosened ice pack swept all before it. The bulk of the traffic by that time was about 3700 car loads per year of wood chips shipped from Plaster Rock. As you can see in the photos from The Bugle the damage was extensive. 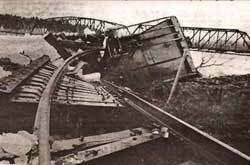 The freight cars plunged into the river as the bridge between Perth and Andover collapsed into twisted girders. Damage to the community was initially estimated at more than $10 million. Thirteen rail cars filled with chemicals used to manufacture fertilizer fell into the river. One car bobbed to the surface and was carried downstream to crash into a highway bridge. Another car came to rest half-submerged on the river's bank at Andover. Due to the cost of rebuilding the bridge and the limited profit from the railroad, Canadian Pacific Railway filed for abandonment (Order No. 1989-R-91 File No. 39309.200). Only 997 loads of the annual 3700 had been shipped. Trucks took over the duty of transporting the wood chips from Plaster Rock to Edmunston. CPR estimated over half a million dollars would be required to replace the bridge, not including costs to repair the damage to the Shogomoc Subdivision. There was considerable opposition including McCain Foods Limited, the Minister of Transportation for New Brunswick, United Transportation Union, New Brunswick Federation of labour, Maritime Lumber Limited, Village of perth-Andover, Village of Plaster Rock and a number of other interested parties. The TVR was officially abandonned in 1991. Subsequently, my family had the rails and ties pulled up. The rails were sold. If you like to hike, much of the right-of-way has become a government-maintained recreation trail along the river. I actually found a diary on the Internet that detailed a walk along this section of the New Brunswick trail system. I always thought it would make an interesting modeling project, but I haven't tracked down enough information yet to make an attempt. Several people have contacted me about the TVR to see if I had more photos or information. Unfortunately, I do not. Return to my Home Page from "Tobique Valley Railway".